THE EDITOR: Sarah Gorham and Kristina McGrath. SUMMARY: (from Booklist): Ten years is a long time to wait for anything. For Jason Sanderson and Lory Llewellyn, it’s how long they’ve each been searching for relief from the emotional paralysis of mourning the same man, Sam Sanderson, Jason’s son and Lory’s lover. For the rest of the world, or at least those fervent New Agers caught up in the hype and glory of the 1987 Harmonic Convergence, the tenth anniversary spells a chance to gather at Grandfather Mountain, a vortex where, if anywhere, there’s a possibility to revisit the spiritual revelry promised by the rare strategic alignment of the planets. A troubled young man, Sam was once a seeker of such mystical wisdom, and his unexplained death a decade ago motivates both his father and former lover to undertake a coincidental journey, looking for an answer to the one question anyone who has ever lost a loved one asks: why? Melancholy yet expectant, McElmurray’s is a keenly sorrowful but plaintively lyrical examination of anguish and longing. THE BACK STORY: “The novel was first a response to the months following a two year travel experience of mine, the last six months of which were spent in India and Nepal. Those months were filled with sound, light, motion—everything from seven weeks spent walking from a lake in Pokhara in the center of Nepal to a temple near Muktinath in the north to some weeks spent on the banks of the Ganges outside of Varanassi. I came back into the United States to a Seattle summer, and there was a huge festival going on, one celebrating the anniversary of The Harmonic Convergence, which is the Mayan Calendar’s ancient prediction of the alignment of planets and the advent of world peace. “That time in Asia, and that New Age celebration, are both in the background of this novel. The Motel of the Stars is also a response to my marriage to John Johns, my partner of some fifteen years now. John and I share a history not only of love and commitment, but also of loss. John lost a son to a Marine helicopter accident back in 1992. I lost a son when I relinquished him to a state supported adoption when I was fifteen years old. Our experiences are so very different—John’s son died and he cannot have that son back again; I met my son a few years ago and share a tenuous relationship with him. Our psychic experiences of grief and longing are also very similar and have made for a complex connection. One early reader called the book an elegy to grief. It is that, and also, I hope, it is an elegy to the possibility of healing. WHY THIS TITLE? 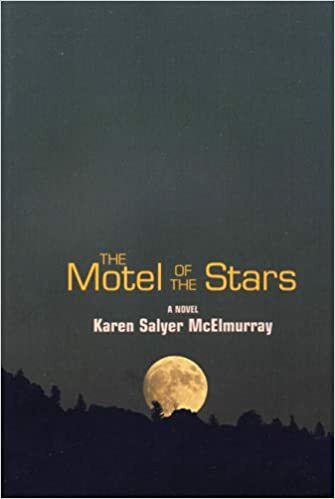 : The title comes from a long ago short story of mine with the same name, “The Motel of the Stars.” The story’s central character was named Sanderson, and he was a wanderer, a survivor of a world war. That character has become both Jason Sanderson and his lost son, Sam. WHY WOULD SOMEONE WANT TO READ IT? I very recently said to someone that ours is an age of cultural PTSD. We are survivors of shooting upon shooting, violence begetting violence, ruptures, I believe, not just economics, race relations, class divides, but also of a deeper black hole, a tear in the fiber of the soul. And I use that word, soul, with caution, since soul can be such a cliché. The New Agers in my novel can believe in buying souls via aromatic oils. They can believe fixing the universe is as easy is aligning a spine, as easy as a neat row of stars. What is the cost of a cultural wound? What is the cost of fixing it? I hope this book at least begs these questions. The Motel of the Stars is a meditation on redemption through love and religion. This second novel Karen Salyer McElmurray does not shy away from the hard questions. Her characters journey through sacred territory. Each setting is drawn in rich detail, and it is a tribute to her skill that we are notjarred or confused by the juxtaposition of Appalachian wilderness, the streets of New Delhi, and the high plains of the Himalayas. She provides an almost giddy sense of bridging large distances, of pondering a globe spinning and rife with chasms. — Appalachian Heritage. AUTHOR PROFILE: Karen Salyer McElmurray’s Surrendered Child: A Birth Mother’s Journey, was an AWP Award Winner for Creative Nonfiction. It was called by The Atlanta Journal-Constitution “a moving meditation on loss and discovery of self.” Her novels are The Motel of the Stars, Editor’s Pick by Oxford American, and Strange Birds in the Tree of Heaven, winner of the Chaffin Award for Appalachian Writing. Other stories and essays have appeared in Iron Horse, Kenyon Review, Alaska Quarterly Review, and Riverteeth, and in the anthologies An Angle of Vision; To Tell the Truth; Fearless Confessions; Listen Here; Dirt; Family Trouble; Women and Their Machines; and Red Holler. Her writing has been supported by grants from the National Endowment for the Arts, the North Carolina Arts Council, and the Kentucky Foundation for Women. Most recently, she was named Distinguished Alumna at Berea College and her essay, “Strange Tongues,” was the recipient of the Annie Dillard Award from The Bellingham Review. She is at work on a new novel, Wanting Inez, which is about fortune telling, tattoos, the mystery of family and love, and the lost identity of land. She is also in the very early stages of a collection of essays called The Land Between. McElmurray teaches in the Low Residency Program at West Virginia Wesleyan College and part time at Gettysburg College. As Jason Sanderson drove the hours east for another foreclosure, he followed signs and directions for only so long. Then he pulled over to listen to cicadas and distant afternoon thunder. He stood in the summer grass, the Joe Pye weeds, tall and purple-blossomed, and remembered himself as a boy, fields where he’d slipped from church with the rest of them to smoke cigarettes and to sip stolen medicinal whiskey. He took in the scents of late August, too sweet wild roses and the pitch-tar smell of coal, and he inexplicably remembered other times. Thirty-some years ago. Saigon. The slick scent of gun oil. The garlic and hard candy taste of some girl’s mouth. He stood in the quiet of strange roadsides and the past was more real to him than now. He was good at what he did—a job in foreclosures in the eastern part of Kentucky. He began his phone calls to potential clients with questions about the weather and family, or with jokes that Rosa said were over the top. What did the Dalai Lama say to the hot dog vendor? Make me one with everything. And when it came down to it, to home visits and demands, he hesitated. He knocked respectfully, pretended he was on a social call and accepted cups of coffee meant as last-minute stalling measures before the signed and dated documents were produced. Today’s foreclosure was for a motel with a name that sounded like Rita Hayworth and Frank Sinatra. The Motel of the Stars. The folder the general nanager laid on his desk some time back was crammed with more photocopies concerning that motel than he could have counted. Purchase orders and bills. Copies of overdue notices and notices of bank reclamation followed copies of threatening letters from lawyers, then notices from the credit bureau. Numerous calls to the owner of the motel, Frank Llewellyn, went unanswered. He had spoken once to a soft-voiced woman who had promised to send back payment, which had failed to materialize. The Motel of the Stars. Even with mirrored ceilings and magic-finger beds, the motel could not be saved. He was supposed to know he was nearing Inez when he saw a store with a soda cooler out front here, a gas pump there. He was to see a sign for a coal refinery called Estep’s and then a field cleared for a tent revival meeting. His general manager, who had the fervor of a televangelist and an obsession with stock market indexes, had especially pointed out the revival meeting. They don’t make them like that any more. A preacher who knows how to shake and rattle and roll. They can heal you, son. He gripped the steering wheel as he pulled onto the road again, still studying the manager’s hand-drawn directions. At a crossroads about an hour back, there was to have been a yellow trailer and then a post office just before the right-hand turn onto a one-lane bridge. There had to be some overlooked landmark. Where are you, sweetie, Rosa would say at times like this, and he would realize he’d been standing at a window and hearing not a word she said about the new sofa slip cover. Where was he now? The signs, turn-offs, and deep green, late summer corn all looked pretty much the same. Who knew how long he’d driven or how far off the map he’d gone? Since breakfast, he had not been himself. He remembered swallowing weak coffee and toast and how his jaw tightened as Rosa described tonight’s gathering in honor of Sam. She’d been planning it for weeks. You’ll see, she said. It would be a celebration of healing rather than of loss. There’d been an extra visit from the once-weekly cleaning lady. She’d bought sparkling juices for a toast. For appetizers, little cheese wedges wrapped in foil, olives neither of them much cared for, fresh bakery bread. It was time, she said, to move on. Since before eight, he had moved east, past blue-green expanses of central Kentucky horse farms giving way to foothills. Barns advertising Mail Pouch Tobacco and family cemeteries lush with plastic roses abounded. Then there was parkway country and soon thereafter a town called Clay City and a diner for a bear claw and strong coffee. Only a few more miles from there and the parkway yielded to more stretches of road with passing lanes, more hills rising to small mountains, and then the mountain, that marked the entrance to Eastern Kentucky Proper. It rose, squat and deliberate, rock facings jutting and cedars reaching for a sky limited to his sight by other squat mountains soon to come. His heart tightened, beat faster, and his breath came quicker in the nearer proximity of country way too much like the hollows and mouths of hollows and heads of hollows that had long ago been his own home. And a couple of hours after that, a turnoff left him fumbling with his directions, looking for Inez. You’re scared, Rosa had told him at breakfast. He did have more than his share of fears. Depths of water. Steep mountains. Today he wasn’t afraid of a thing. Today, something else gripped his heart, propelled him forward past mountain after mountain and sign after sign for little Eastern Kentucky towns. His heart beat and skipped and beat. After his stints in Vietnam, a whole slew of doctors had diagnosed everything from heart nodules to anxiety and counseled him to put his feet up, relax more. One of them even urged him to meditate. Today, he liked this feeling that carried him past town after town. He had exited the parkway a long while back and now houses dwindled in number, nothing but cornfields on one side of the road and fetid-stnelling river on the other. Happy. Feisty. Climax. He sped up with the cheerfulness of these names through a hole-in-the-road town called Radiant. Usually he listened 10 tapes of show tunes or to stations playing country oldies. Trailers for sale or rent. Rooms to let fifty cents. Now he flipped through AM and FM, but he kept coming back to hypnotic sounds that put him in mind of belly dancers. In honor of a festival called The Harmonic Convergence, there were flutes, a keening stringed instrument, and a radio announcer offering insights. Follow the sounds of cosmic consciousness. Rhythms that vibrate to the sound of one universal mind. Sanderson supposed the music was meant to be religious in some way, but religion wasn’t right either, since that was hymnals and childhood prayers. Which was the one that always made him shiver? If I should die before I wake, I pray the Lord my soul to take. The memory of that prayer and the music both recalled his anger and he flipped off the air conditioner, leaned out the open car window, inhaled the pungent air. This many-years after his first wife’s death, words she loved came back to him. Pungent. Esoteric. Columns called “Enrich Your Vocabulary” and “The Power of Words” were her favorites and she had loved any and every dictionary. Visual ones. Foreign language ones. She consulted bulky desktop versions and pocket editions at odd moments on family outings. She’d give Sam the gift of a sentence. The pungent atmosphere left him feeling disconcerted. Pungent. Sanderson savored the word now. He loosened his tie, found a new radio station, part static and part country. Hank Williams. Cause tonight I’m gonna see my caramio. Tonight he’d be home again, to fat new sofa pillows and exotic foods for a celebration. Celebrate rather than mourn? His son, dead ten years. One-handed, he slid his tie off, tossed it into the back seat, set off down the road again. That door had been shut a long time ago and he wanted it to stay shut, ten years’ anniversary or not. The first year Sam was reported missing at sea, Sanderson had felt numb. Numbness gave way to a grief that made him feel ashamed. Anger at no one in particular swirled in his heart. Rage gave way to uncertainty. He was perplexed when he studied his receding hairline in the bathroom mirror. He grew sideburns and a goatee and plucked gray hairs he’d never seen. He bought Grecian Formula, slimmer ties, and a cologne called Incognito. He took a night class or two, one in astronomy and another in poetry, and he wrote verse that his instructor said was sentimental. There were too many poems about butterflies, sunsets and love. He was never able to describe what he really meant—that image in his head of wings against a door, locked tight against something he didn’t want to name. He bought a place in Kentucky, in the center of the state. Took a new job. Repossession case manager. For the new house, he bought a gun case for the living room and stocked it with oiled rifles he never used. He took up golfing, a sport that had never much made sense to him, and he agreed to go on a number of blind dates arranged by his office coworkers. Shirley, a woman with nails bitten to the quick, phoned him three times after their Saturday afternoon coffee date, but he let the machine take the calls. There was Tiffany, who left salty-tasting blueberry pies on his desk at work, and Brenda, who talked him into attending a meeting the Fellowship of Christian Scientists. Lisa. Judy. Lee Ann. Rosa, fifteen years his junior, worked at the real estate office. She had long red hair and she wore blouses buttoned to the neck, plastic glasses that hid her lovely green eyes. She was just separated when he asked her out for coffee, and he found himself telling her things he told no one—stories about Saigon, about hawkers’ stalls and rainforests, about the times he’d drunk rice whiskey and wished so badly for home he could taste it. He did what he never did, told her the names of three buddies of his who never came back from the war. TWO weeks later he met Rosa for lunch at the room she was renting in town. Unbutton your shirt, she said, and he’d never felt more at ease. They married quickly, their wedding a small gathering in the home of Rosa’s former high-school principal. There was a three-tiered cake and there were gifts of small appliances Rosa substituted for the less reliable ones he still owned from his marriage to Sarah. Rosa adored him, told him tlus often, told him how he had rescued her from her former country store owner husband, for one. And since the marriage? The last four years had vanished. Evaporated into the atmosphere, Sam would have said. Dinner parties with friends. Country music concerts, of which Rosa was fond. “frips to shopping malls for china and the latest patterns of stainless steel. Vacations up north. Recently, she was on a course of self-improvement, working on everything from her vowels—the way she stretched out i and a with a question embedded at the end of every sentence—to her entertainment skills, to her consciousness, with the help of pop psychology books and a regular Tuesday-night meeting for couples called Energize the Inner You. Emotional Wellness Encounters, they were called, led by a counselor named Harry Simon, a man with frizzy gray hair and sparkling dentures who spoke of inner peace and spousal communication skills as if they were on sale at a discount store. Harry Simon, as group mediator, kept saying, Let it go, let it go, but Sanderson couldn’t summon a particular time or place for it, though he was fairly certain what they wanted. Rosa wanted more than the war stories he’d told her. She wanted ones about explosions that could make the ground shake beneath your feet. Stories about gunfire and gaping wounds. Weren’t you afraid, Jason? she’d ask him in the encounter groups and he’d feel himself grow sullen in his wish to tell no story at all. Fear. Were there words for it, those times he’d felt fear settle under this tongue? Jason Sanderson, his father used to say, make your bed. Make your bed and lie in it. He had made his bed by now, and he knew that.exactly, but he wanted some way for his name to be carried into the future. Rosa never exactly said no to this wish of his, but they had not discussed it either, not really. We all have our dreams, our should’ve, could’ve, don’t we, sweetie, she said and sighed and left a kiss in lipstick on his cheek, then busied herself with a handkerchief. By letting go, he knew Rosa meant more. His past. Wife. Son. And more than them, really. How to let go of a son he could on some days scarcely recall? A place he went, a removal that frightened her. That was what Rosa wanted gone the most. Jason, she’d say when she’d find him sitting alone, staring out a window or at a blank, white wall. He found himself shaking off lethargy and he turned, as if from a great distance, met her smile. Then he felt it most. Vertigo. An enormous height, a precipice. A dizzying fear and afterward an anger so intense it made him sick inside. If he sat still, some days, he thought he might just be able to step closer to it, the vast distance he’d traveled from his own heart. Signs for a sorghum festival littered the Main Street of Links. That street was just a post office, a five-and-dime, and a fruit stand. A general store promised a Grand Opening and Hot Lunch. He hadn’t eaten lunch yet and he could hear Rosa. You live on snack mix and nervous energy, Jason. Links was as good a place as any, so he drove the main street up and back looking for a place to get some coffee, and settled on a grocery store on the front steps of which sat a boy picking through a mess of weeds and greenish water in the bottom of a metal pan. “That looks tasty, son,” Sanderson said as he paused on the steps. Sang. Ginseng. Sanderson turned those words over in his mouth. “I don’t think I’d know ginseng if it bit me,” he said at last. He had a recollection of his grandmother and a trip to the woods to pick greens or to hunt up this and that herb. The boy plucked a gnarly root out the pan and cast it in the direction of his high-topped sneakers. “Granny’s got me going through everything, just about,” the boy said. He plucked a tiny rock out of the pan, flicked it with thumb and forefinger. His hand had a tiny anchor tattooed on its back. “She got anything to eat in there?” Sanderson asked as the boy set the pan aside and stretched his skinny, longish legs. He followed Sanderson inside the store. Bolts of cloth and stray shoes and canning jar lids spilled from boxes here and there, and a woman crouched on her ankles near an open crate. The woman nodded as Sanderson made his way around the pile, and then she stood and gestured with one hand clutching a plastic baby doll. “Pardon my housekeeping, mister,” she said, her voice a wind-piped whisper that made him want to clear his own throat. As she peered up and down at him, he wondered why he’d carried in his briefcase. “Got enough stuff in here to clothe the hungry and feed the poor too, mister.” She tossed the doll into a box and nudged a heap of papers with one booted foot. “That so?” Sanderson said as he eyed the store’s shelves, stocked with the basics, soups and toiletries and animal feed. The store had a grainy scent of feed, a bitter odor that stung the nose. “My daddy run this store up to the day he died and I don’t reckon he ever throwed out nothing. ” She sighed and shook her head. “Take my daddy, now, mister.” She wiped her hands on an apron marked with grease spots. “You sit right there and tell me if a man needs to keep ary old soap scrap and snake skin he ever come by.” She shook her head. Across from the shelves were racks of items that must have been geared to tourists. Straw hats. Recycled Mason jars labeled Pickled People, which were small, decapitated heads with puckered faces, made of bits of cloth and cotton. Dried, weedy looking bundles were tacked to the tops of shelves or suspended from the store ceiling. Sanderson glanced down at jars full of the gnarled roots the boy had been sorting through, and more. Bits of stalks and stems. Seedy looking pods. “Daddy’s the one,” she said, “taught me about healing. Ministering herbs. While she talked, Sanderson studied Granny’s powdery-looking face and lilac-colored cotton dress. He noted her anklets, ones neatly turned down above her shoes. She could have been his own grandmother. “Not that I took natural to learning what Daddy had to teach me,” she said. “I was too fixed on running here and there and yonder. But he was a good man, my daddy. I’ll give him that one.” She sighed. “Raised six younguns,” she said. Close to the shelves was a cheese and meat cooler, a counter with a crock pot advertising beans and cornbread and, Sanderson was relieved to see, a 110t dog warmer. He pried a charred-looking wiener off when it came around on one of the revolving prongs, piled on mustard and relish and onions from canning jars marked necessaries. The coffee was instant, and he dumped in llwee packets of sweetener. your ear?” Ille hoy asked. He’d followed Sanderson back out onto the porch, where he stood eating and looking at the empty parking lot and the tail end of Main Street. The boy was also eating a hot dog and the two of them regarded Sanderson’s car, a black Pontiac with white wall tires and a license plate with the last name of a famous auto racer, one of Rosa’s idols. Sanderson had to think a minute, and realized he had no idea. He mumbled something about a V-8 engine, and munched his hot dog. “You ever ride anybody in that car?” the boy asked. “I’ll bet you could think of a person or two.” Sanderson swallowed his hot dog. It was well after noon by now, a heavy-looking midday. Sanderson checked his watch and stood, studying boy and car. Like Sam at that age, he was half boy and half on his way to being a man. Unlike Sam, he was dark-skinned, with blue-black hair. Fifties style, he wore his tee shirt sleeves rolled, with a pack of Marlboros stuck there. Too young to smoke, Sanderson mused. The boy recited information about torques and engine types and drive trains, and the future glowed in his eyes—a shop all his own as an add-on to the store. “If I’d had a car like that I could have gotten over there that quick. ” He snapped his fingers. Sanderson wadded up the hot dog wrapping paper and made a move toward the porch steps. “Over where?” Sanderson asked, pausing midstep. “Sign of what?” Sanderson swallowed, once and twice. The hot dog taste was still in his mouth, charred and gritty and he began to feel unaccountably tense. She leaned close, her scent sweet, like pouch tobacco. “Don’t you know nothing, mister?” She elbowed him. “Smoke’s a sign of trouble or the Lord, one,” Granny said as she pointed up at wisps of grayish clouds traveling west, the way he’d come this morning. With a sinking feeling, Sanderson peered up at the whitish sky. “Most of it’s settled from over that way, besides,” she said and elbowed him a final time. “Over where?” he asked again as the three of them studied the haze. A heavy feeling had begun to accumulate in his chest and he fumbled in his pockets for tablets to settle his stomach. “How many do you reckon there are in Inez, mister?” the boy said, looking indignant. He pulled the cigarette pack from his sleeve. “What happened over there, son?” Sanderson asked, dreading the answer. The taste in his mouth had coincided now with the smoke-laced sky. The three of them regarded that sky and the woman pointed down the road in the direction he still needed to go. As he pulled the car back onto the road, he could hear Rosa. Don’t you just find people tike that a comfort? The very thought made him sad. Safety? Comfort? His first wife, Sarah, filled their house with a variety of items in which she took comfort. Incense cones and burners. Prayer wheels. Candles to invoke safe spirits. At the same time she teased him about wanting the whole world to be safe, from his sock drawer to the details of the morning news. Safety, Sarah would say. Don’t you know that’s a relative term? And now Rosa, his second wife, had joined one self-help group after another, ones that promised safety for the inner child and renewed interrelational-communication skills. Their house was littered with things she called “old-timey.” One whole den wall was devoted to a display of washboards and band saws and signs for Martha White Flour or Bunny: The Best in Bread. Don’t you take comfort in your heritage, she asked him when he suggested that there were too many things, too much nostalgia. To heal himself after Sarah died, he moved with Sam from the mountains of western North Carolina to central Kentucky where he became regional officer for his repossession company. Regional Repo Man, Sam had called him, which left Sanderson with an image of himself in a super hero costume, defending his office against nonpayment and bad credit. Once Sam was gone and once he married Rosa and they bought a house in a gated community. To get home, he passed through a raised bar and a security guard who nodded to him each and every evening. Mr. Sanderson. How much more safe, Rosa wanted to know, could their lives be? Gated. Sanderson could almost hear Sam. Facsimile. Pretend country living. As much time as Sanderson had spent trying to batten down the hatches in his life, Sam had been the opposite. Sam. The exact opposite of that word. Safe. Sam. Sarah. Rosa, her pronouncements about heritage, about healing and moving on. He wondered whether strong, dry hands, his grandfather’s or anyone else’s, might have, could have, pulled his son up from the waves of the ocean that took him. No one really had the power to heal, no less comfort anyone in this world. He drove on, approaching at last The Motel of the Stars under a sky that was, sure enough, thick with smoke. He passed the Inez diner and then a hardware store and a trailer park. He loved reading the new directions the boy and his grandmother had given him, drove until he saw the Church of the Repentant, his new landmark. He the last sharp curve and had to slow down, back into a driveway, turn I passed the last five mailhoxes, rechecked his directions. There’d been a fire the night before, all right. What was left of the motel looked careless and abandoned. He sighed and picked up his briefcase and stepped out of the car. Glass from broken windows crunched under his feet as he approached the side yard where there were the odds and ends of everything heaved out at the last second. A dresser with the drawers gone was upended near a metal foot locker; a plastic child’s tractor trailer was melted and shapeless and lay next to what was left of a wooden-framed photograph of a dog. Now, only the last walls of the building itself were standing, and those were a charred substructure held together by pipes and thick, blackened wires. He could have found his way to Inez by smoke-scent alone. He followed a path littered with before-the-fire cans and bottles that led behind the house. That’s where the people were, less than a dozen of them, seated around the base of a huge willow tree, its trailing fronds singed. A worried-looking woman with foam curlers didn’t meet his eyes. Near her was a younger woman in jeans and cowboy boots, and beside her an old man in a wrinkled wool suit jacket was crouching on his ankles, stirring ashes and dirt. He took his place at the edge of this group. “Authorities been here yet?” he asked in the general direction of the old man, but no one spoke. He wiped his sooty hands against his trousers and stood, waiting. Already he could envision the investigation he’d have to conduct. Already he suspected arson and he thought of the forms he’d have to fill out, his own possible accountability. Didn’t you have an inkling? Not a clue about these people? He could hear the bank manager now. Then he heard the voices. Singing, from a rise near the smoldering foundations of the house. He stared in that direction, where there were two little girls. They wore cotton checked dresses, sneakers with the toes cut away, and their joined hands were lifted high as they danced in the grass. Pocket full of posies, the girls sang as they spun. Ashes, ashes, we all fall down. From not too far away, someone called to the children. Don’t you all hear me? Get on home. The girls laughed and whispered and hurried up a rise and their laughter died away in the distance. Sanderson set his briefcase down in the grass and approached the chair. Eastern women covered by impenetrable veils, but more than that. The small pale and sooty face with its shut eyes, was both familiar and disconcerting. She seemed to be sleeping. “His girl,” someone said behind him. “Pardon?” Sanderson asked. The old man with the wool jacket motioned to him. They walked several feet away from the chair, in the direction of the lemains of the house. “What’s her name?” Sanderson studied the huddled figure. Beneath the edges of the blanket, he could see bare feet and polished toenails. “Lory,” the old man answered. “She’s about as odd-turned as he is, I’d say. ” “Where’s he at?” Sanderson gripped his briefcase, thinking of the coming encounter with Frank Llewellyn, the questions about how the fire had started, insurance premiums, responsible parties. Sanderson’s head swam with red tape it would take months to figure out. Sanderson straightened his tie, remembering the recent acquisition of the storage building and repair place. “I came on business, you know,” he said. He studied the woman and the chair again as she shifted. The sight of her face, so incredibly still, tugged at him. “It’s a shame it didn’t do as well as the rest of us would have wanted,” Sanderson said, and then was sorry for it. If he hadn’t known better, he would have said the woman was peaceful, except for the deep lines etched beside her mouth. They both stood looking in the direction of the woman. She was so still Sanderson could see the blanket rise and fall with her breath and he found himself breathing that way too, in time with the rise and fall of her chest. His own chest, to his amazement, felt calmer than it had all day. He stepped back from the chair, breathed deeply. On the table near the woman was an open dictionary, hardbacked and heavy, a random save from the fire. Its pages rustled in the wind and he wondered what page the wind would settle with, what word.